Twelve weeks ago, almost to the second, Sienna was put on my chest; pink as a candy, eyes wide open. Twelve weeks that went quickly, and also, twelves weeks when winter came and went more times that I can count. There was the night we rushed to the maternity; the air suddenly so sharp we’d forgotten how it felt against our cheeks. There was the first snow, as early as the third of October, which was gone a few days later; and as it did, the longing for a winter as I had known it only became more intense with every morning that passed by without a snowflake. And then, one day, winter was here, not that it didn’t come without a warning. The afternoons by the river, frost on every branch. That Sunday when snowflakes were big as cotton balls. And the clear evening skies we had last week when the temperatures dropped to -20°C. In our kitchen, there is a bread made of rye and filmjölk [sour milk] on the counter. And every time we open the pantry, the earthy smell of saffron fills the room. We have blueberry cakelets in the fridge, and lussekatter in a jar above it. A mjukpepparkaka [gingerbread cake] on our table, and a baking tray filled with brown butter and cardamom salted caramel, waiting to be cut. Yes, there is so much I want to tell you about, but Christmas is only a few days away, and some things cannot wait, like these saffransmazariner. Sometimes, a thin layer of jam covers the bottom of the tart shell, or the filling can be topped with fresh berries before baking, in which case, the mazarin isn’t glazed. Its origin – although I haven’t quite had the time to research – seems rather uncertain, possibly linked to an Italian cardinal who moved to Paris and first assisted Richelieu, only to succeed him in the mid seventeenth century. Through his regency, Cardinal Mazarin has been thought to popularise pasta and perhaps, other Italian delicacies in France and Sweden (which were rather new allies then). And although there is no evidence of it in literature, mazariner do strongly remind me of the traditional crostata di mandorle, a very similar tart from Italy. My saffron mazariner are the festive version of the Swedish favourite. You see, I have the bad habit to buy mazarinformar [mazarin moulds] at every garage sale; so really, I’m always looking for an excuse to bake them under one form or another. 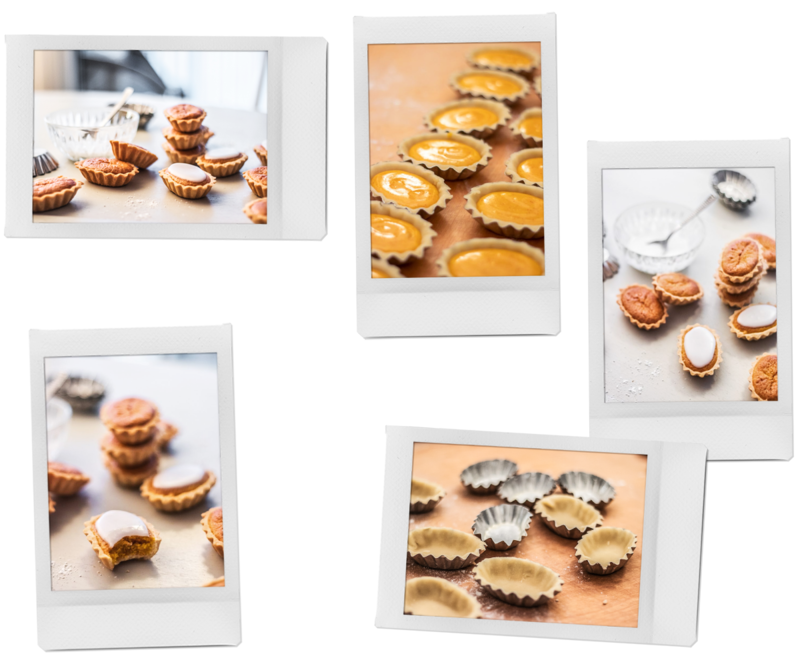 You can use any tartlet moulds, ideally around 5-6cm in diameter, but in a pinch, I suspect a muffin tin will do fine too. A large mazarin, sliced in thin wedges would also look fantastic on a cake stand! I tend to make it in the food-processor, but a stand-mixer works too. As always, I can only recommend rolling it before letting it to rest in the fridge; however this dough is quite forgiving, and when I don’t want to use up a lot of baking paper or if I’m feeling lazy, I will wrap the dough in clingfilm, and chill it for 20-30 minutes, then roll it onto a lightly floured bench. For more tips on how to handle tart dough, please refer to these posts here. Mazariner freeze beautifully. On the day you want to eat them, simply take them out for a few hours, and glaze them with a simple icing sugar glaze. Make the dough. In the bowl of a food-processor, place the flour, sugar, salt, baking powder and butter, and mix until the mixture ressembles wet sand. Add the eggs and pulse until it just starts to form a dough. Divide the dough in two and roll each piece to 3-4mm thick between two sheets of baking paper. Place onto a tray and chill in the fridge for 20-30 minutes. In the meantime, preheat the oven to 175°C/fan 160°C, and brush 28 (or more, read note above) tartlet moulds with melted butter; setting them aside until needed. Make the filling. Melt the butter in a small pan and add the saffron. Mix well and allow to infuse for a few minutes. Place the marzipan, eggs, salt and flour in the bowl of a food-processor and mix to a smooth paste. Slowly add the butter, mixing as you do so. Transfer the filling to a piping bag. Take the dough out of the fridge and loosen the top sheet of baking paper. Flip over and remove the other sheet, this way, the dough still is on baking paper, yet doesn’t stick to it (I hope that makes sense). Cut out the dough into small ovals or circles, depending on the shape of your tins, and line each with dough, trimming the excess using your thumb or a small paring knife. Place the lined moulds onto a baking tray, and fill them with your saffran almond cream, around 3/4 full. Bake for 20-25 minutes or until golden brown. Allow to cool down for 10-15 minutes, then unmould. Mix the icing sugar with a drop of hot water, just enough to form a thick paste, and spoon on top of the mazariner. Allow to set for an hour or two, then store in an airtight container for up to five days. You can also freeze the unglazed mazariner for up to 3 months (see note above). Ils sont trop beaux ces petits biscuits! !